Corrugated metal hose allows for the transfer of liquids or gases, usually at high pressure and high or cryogenic temperature, while remaining flexible. Annular hose is formed from tubing into individual parallel corrugations. Helical hose is also formed from tubing but into a continuous spiral corrugation. Both designs allow for flexibility of the hose assembly under pressure. 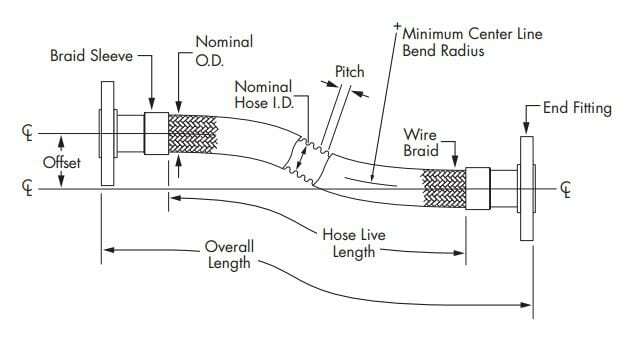 In addition, helical hose has unique self-draining properties. corrugations per foot. This hose will not be as flexible as a Standard Pitch hose and will have a much lower flexing cycle life. Open Pitch hose is intended to be used in less severe applications where flexibility and cycle life are not an important requirement or as an effective method for dampening vibration. and can be used in more severe applications where ease of flexibility is important. Metal wire braid on a hose assembly provides the hose assembly a higher pressure capability by acting as a restraint against hose elongation and acts to dampen vibration. A second layer of braid may be used to increase pressure ratings provided the test pressure is not exceeded. of squirm. Properly designed braid coverage will balance pressure capability with flexing requirements. Minimization of braid wear on the crown of the corrugation is also provided by optimal braid coverage. Tubular Braid is manufactured by grouping single wires and then braiding them into an intricate pattern that tightens when the braid is stretched. Such a group of wires is also known as a strand. Construction of the braid is expressed as (number of carriers) x (number of wires in each group) x (wire diameter). An example would be 24 x 8 x .012 where 24 is the number of carriers on the braiding equipment, there are 8 wires in each strand of wires and the diameter of each wire is .012″. Larger diameter hose assemblies require the strength of Braided Braid. Braided braid is manufactured the same as tubular braid except that wires in the strand are braided together prior to the manufacture of the braid. Construction is expressed the same as tubular braid except the use of parentheses around the groups of wire and the wire diameter. An example would be 128 x (21 x .016) where 128 is the number of carriers, 21 is the number of wires in each group and .016″ is the diameter of each wire in the braid. The braid sleeve or ferrule is used to isolate the end of the corrugated hose and braid from flexure. The core and braid are welded to the braid sleeve or ferrule during fabrication of the hose assembly. Properties of the hose and braid material are changed during welding. This area where the properties are changed is known as the “heat-affected zone.” The heataffected zone must be isolated or premature failure of the hose assembly can occur. Care should be taken to insure the braid sleeve or ferrule has a proper fit. The cover or armor on a metal hose assembly is used to protect the braid from external abrasion or to diffuse the media inside the hose in case of rupture. Many different materials can be used including interlock casing, heat shrink covers, lay-flat or many types of heavy-duty elastomers. The use of covers that contain chlorides (such as PVC) should be avoided. near the end of the hose. A short interlock casing or spring guard is generally used to restrict bending. recommended levels require the use of a Liner. Material for the liner is usually an interlock hose and it is welded to each end of the hose. The liner will allow for a smooth flow while maintaining hose flexibility and will reduce the inside diameter. The bend radius of the interlock hose may limit the bend radius of the corrugated hose. A directional flow arrow is normally provided on the outside of the hose assembly.